The Hotel Papadopoli Venezia - McGallery Collection by Sofitel is a four-star, full-service hotel near the Grand Canal. It has an excellent reputation, especially among guests who stay at the Popadopoli before or after cruises from the nearby Marittima cruise terminals. 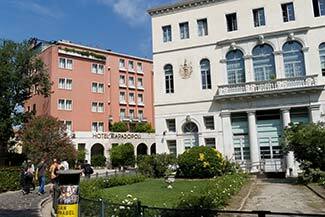 It's just across a small bridge from the Piazzale Roma, which is Venice's terminus for airport buses, taxis, and the People Mover (an automated tram that serves the Marittima cruise port and the Tronchetto parking island). Follow the curving path through the greenery on the other side of the bridge. The Hotel Papadopoli Venezia will be the large stone and pink stucco building on your left, just before the next canal.